This is really big cable with low RF Signal loss for when you only need a couple hundred feet of really big cable with low RF Signal loss for use between Cable TV Antenna Satellite Dish locations feeding underground to the Set top box Receivers and TV sets inside the house. Low Signal Loss Underground Coaxial that Features a PE (Poly Ethylene) Jacket over Two layers of Bonded Alunimum Foil and (2) layers that total 100% Aluminum Braid, Bonded Foam Dialectric with a Copper Clad Steel Center Conductor. Perfect for HDTV, DTV, DBS, Cable TV, Master Antenna and Satellite Master antenna Applications with 1.0 GHz Bandwidth. Can Also be Utilized as an Underground Signal Feed Transmission line from Towers, Dishes, Antennas and Telephone Poles to Home, Office and Premise. NoteSuperShield (Quad Shield) - Taking the Tri-Shield construction one step further, this construction adds an additional layer of shielding braid to provide the greatest strength, durability and immunity from network interference. Provides low attenuations for service drops greater than 150 feet in length. In the entire Cable Product line, this is our greatest seller. Our Customers are using RG11 Quad Shield cable, Connectors, Cable Prep Tools and Amplifiers to Increase the Signal Level at their Cable TV and Satellite Receivers to take advantage of the ever burdgeoning Bandwidths of New HD signals being Broadcast. This RG11 Cable Product is designed for Underground and Direct Burial Usage (Inside a Conduit or Out). It Features a Polyethylene Jacket with a Flooding Film or Jelly Compound contained within the Coaxial Cable Jacket, between it and the last layer of shield. This Moisture Barrier is present really as fall-back measure should the integrity of the Sheath fail. At that point the compound will ooze to fill the void as to displace accumulated water, or the film will simply repel the vapor from reacting with the Aluminum in electrolysis or oxidation. RG11 (RG-11) is to 75 Ohm as RG213 or RG214 is to 50 Ohm cable. RG11 Cable featuring 60% Braided Shield is comprised of an Aluminum Foil bonded to the Foam Dialectric with Aluminum Braided Shield with 60% coverage. Quad Shield RG11 would denote alternating Aluminum Foil and Aluminum Braided Shield Layers, starting with the Bonded Foil Layer around the Foam Dialectric, with the better Quad Shield having 2 Layers of Braided Aluminum Shield, one of 60% and the 2nd at 40%. Tri-Shield RG11 will have 77% Braided Aluminum Shield Coverage Between 2 Layers of Aluminum Foil Shield, the 1st Foil Layer being Bonded to the Foam Dialectric. RG11 is the lowest loss Flexible Braided Shield Drop cable Commercially Manufactured for Satellite TV, TV Antenna and Cable TV usage. Use for distances over 150 feet or when every dB counts. 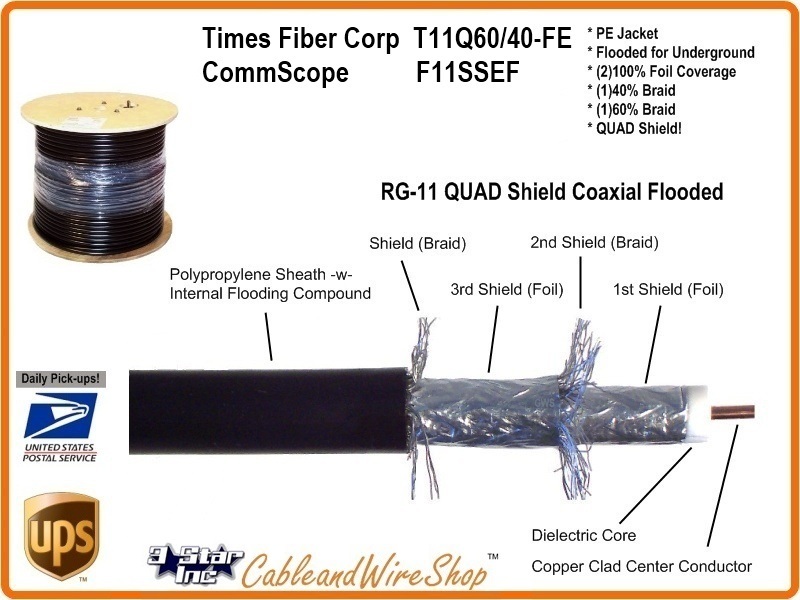 For Cable with less loss than RG11, one would then have to avail themselves to Hardline Coaxial with a Single Solid Shield (typically Aluminum) that is pricey, but delivers commensurate Results for the Money. Most all RG11 Manufactured uses Aluminum Braided Shield, the difference of note being the amount of Aluminum Braid Coverage and the composition of the Center Conductor; Solid Copper vs. Copper Clad Steel. Copper Clad Steel will suffice in almost any utilization scenario, however most Satellite TV Operating companies will require Solid Copper Center Conductor to be used by their respective Sub-Contractor Installers for Maintainence and Warranty issues. This is due to the DC Voltage component being fed from the Receiver back to, and Powering the LNB(f)s mounted on the Satellite Dish. Unless the run is extremely long and the connectors applied are of dubious Quality, the DC Loop Resistance difference between Solid Bare Copper and Copper Clad Steel is negligible.